The cast is comprised of about 25 children, ranging in age from 8-18 years old. Most of them are under 14 years old. The varied age range gives participants a chance to interact with children of different ages: older children lend a helping hand to the younger ones with makeup and costumes, lines and dance steps. Interaction with staff and parent volunteers who help get the production ready to go allows for intergenerational mentoring to middle school-aged children. PlayTime appeals to children of all kinds of talents and ambitions—those who are actively involved in many activities, and those for whom PTP is their only group activity. For many in the cast, this will be their first play. Children do not have to prepare memorized pieces to audition, they just must be ready to read, sing a little, and try a few dance steps. 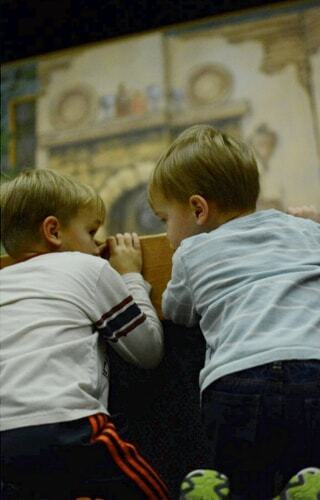 Two young audience members anticipate the start of If the shoe fits…A Cinderella Story. Our schedule as a touring company involves a different production each fall and spring. PTP brings live theatre to family audiences in Belleville, Madison, McFarland, Monona, Mt. Horeb, Sauk City, Stoughton, and Waunakee. One of the unique aspects of PTP is the opportunity it offers to children to perform in different types of venues—from a middle school auditorium in a small town in Dane County to the Overture Center in downtown Madison. Each time PTP casts perform, it will be on a new stage for an audience that is different from the last. This change in venue enhances the children’s versatility and thinking skills as they learn how to adapt to varied space and time constraints. In addition, cast members are assigned tour responsibilities so that the entire production can move efficiently from one location to another. Under adult supervision, props and costumes are inventoried, organized, and loaded onto vans. Cast members don costumes, and put on their own makeup. When the curtain comes down at the end of every performance, the cast knows its work is not done: they pack up the sets, lighting, and music equipment and load it back onto vans along with costumes and props—ready for the next performance.